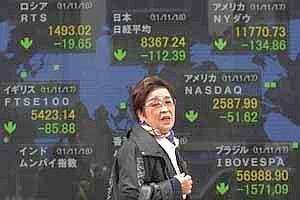 Japan’s Nikkei 225 index dropped 0.9% to 8,406.04 and South Korea’s Kospi shed 0.1% to 1,854.36. Hong Kong’s Hang Seng lost 0.7% to 18,136.53. Australia’s S&P/ASX 200 rose 0.3% to 4,112.20. Japan’s industrial production rose 2.4% in October from the previous month, the government said Wednesday. But the Ministry of Economy, Trade and Industry expects it to dip again in November and described industrial production as “flat." A meeting in Brussels of finance ministers from the 17 countries that use the euro ended without an announcement on plans to contain the debt crisis that is threatening to shatter the currency union. The ministers sent debt-riddled Greece €8 billion ($10.7 billion) to stem an immediate cash crisis, but they kicked more difficult issues — such as whether countries should cede some control over their finances to a central European authority — to the leaders of the European Union who meet next week. In the latest sign of trouble, Italy was forced to pay a high interest rate on an auction of three-year debt Tuesday. The 7.89% rate was nearly three%age points higher than last month, an enormous increase. If Italy were to default on its debt of €1.9 trillion ($2.5 trillion), the fallout could spell ruin for the euro common currency and send shock waves through the global economy. On Wall Street on Tuesday, a jump in US consumer confidence sent stocks modestly higher. The Dow Jones industrial average rose 0.3% to close at 11,555.63. The Standard & Poor’s 500 index rose 0.2% to 1,195.19. The Nasdaq composite, which consists mostly of technology stocks, fell 0.5% to 2,515.51. The Conference Board, a private research firm, said its Consumer Confidence Index climbed 15 points in November to 56.0 — an improvement, but still well below the level of 90 that indicates an economy on solid footing.